Five most downloaded presentations in 3rd Indonesia Carbon Update Conference. There is a mistake regarding event title name in graph above. It should 3rd not 2nd. 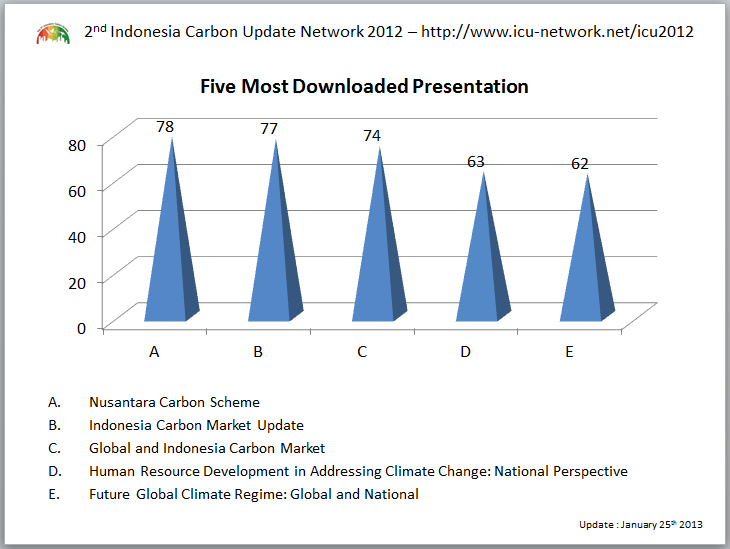 This graph shows five presentations which were most downloaded from 3rd Indonesia Carbon Update Conference that was held from 5 until 7, November 2012, in Jakarta. The Y axis shows the number of download in unit number and the X axis shows the symbol that represent the title of presentation which can be seen in legend below the graph. This data was extracted at 25 January 2013. From this graph, we can see that the most presentation was downloaded is Nusantara Carbon Scheme which was downloaded 78 times. Followed by Indonesia Carbon Market Update at second position which was downloaded 77 times. Global and Indonesia Carbon Market toke 3rd position which was downloaded 74 times. Human Resource Development in Addressing Climate Change: National Perspective and Future Global Climate Regime: Global and National which were downloaded 63 and 62 times toke 4th and 5th position respectively. The difference numbers of download is relatively similar between one file with the other. The name of topic also have similar between this files, related to carbon market and future perspective of climate change. The rest of information detail regarding of this conference and presentations can be found at http://www.icu-network.net/icu2012.